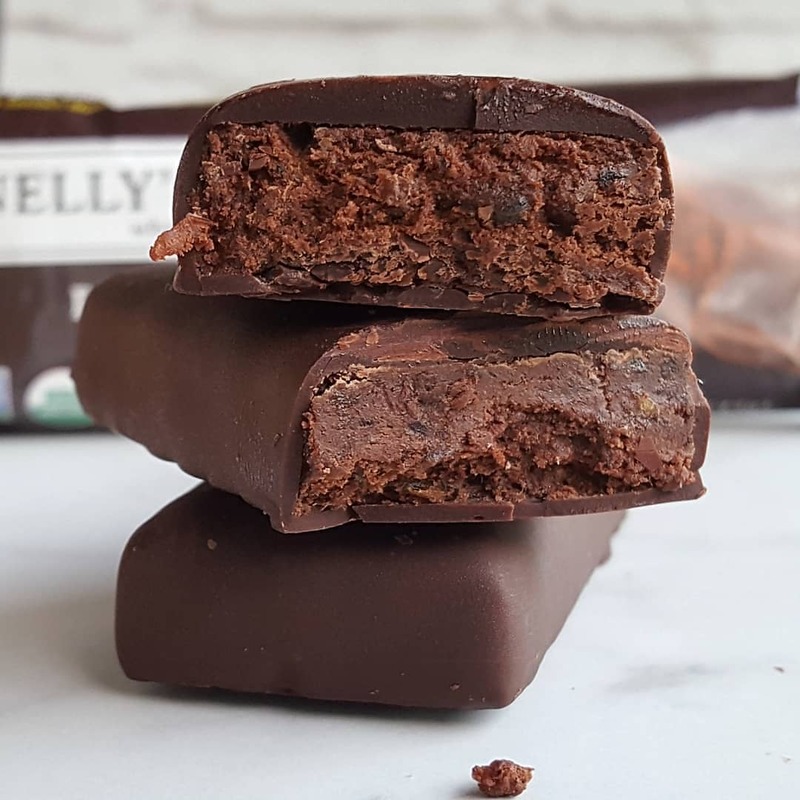 In my ongoing search for a healthier alternative to the sugary and additive filled confections offered in supermarkets, I came upon Nelly’s Organics: a line of scrumptious certified organic candy bars in the refrigerated section of a Fresh Market that sell for just $2.99 a bar (note: most certified organic chocolate bars cost two or three times as much). With no preservatives (which is why they are in the refrigerated section), additives, dyes, powders, fillers, by-products, nutritional supplements, or added stimulants, Nelly’s Organics contain real ingredients that have been certified organic. 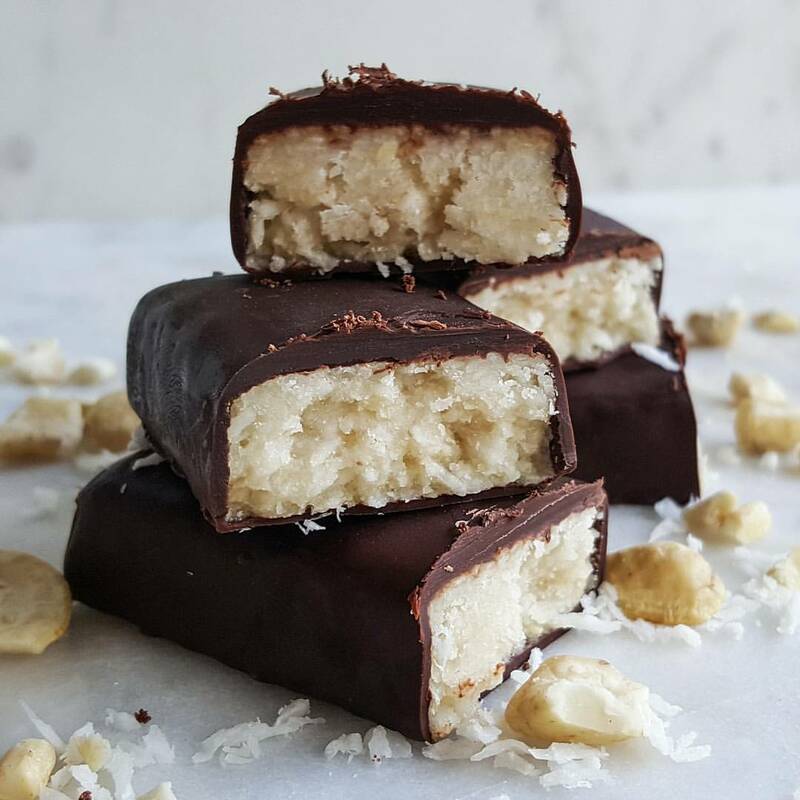 Coconut Bar: If you’re a Mounds bar fan, this is the bar for you! Chewy, rich, and decadent! 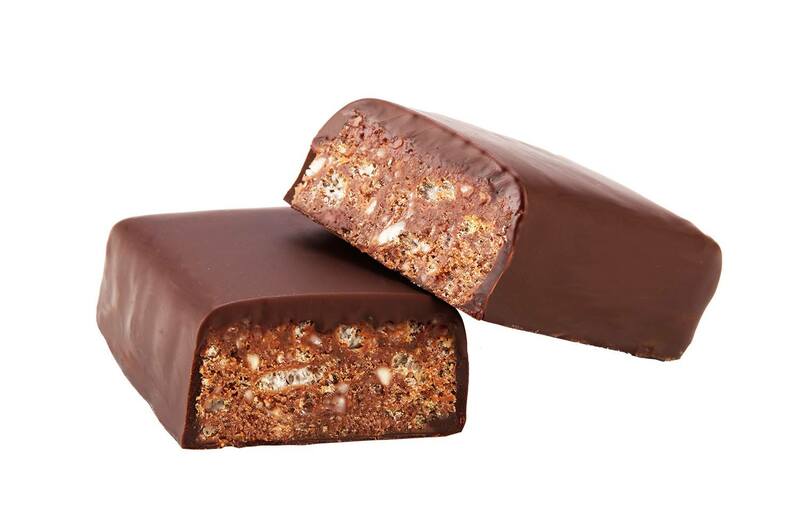 Chocolate Crisp Bar: This is for fans of Nestle’s Crunch..only chewier and better! Double Chocolate Bar: Chocolate, chocolate, and more chocolate! 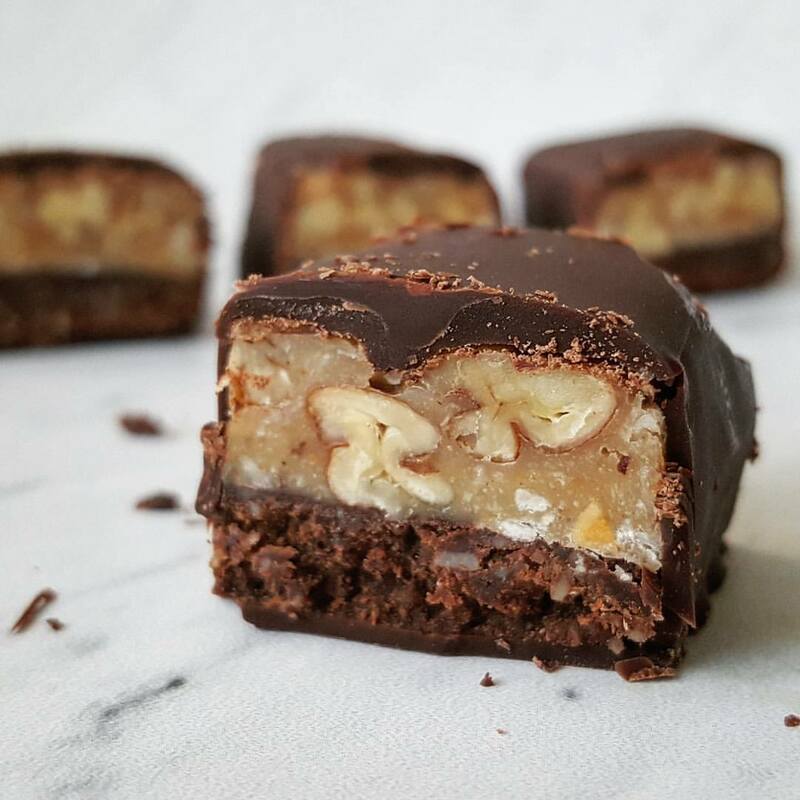 German Chocolate Bar: This bar is loaded with pecans, almonds, coconut, and peanut butter. One of my favorites! Mint Chocolate Bar: This is a cross between a Nestle’s Crunch and a thin mint girl scout cookie..but about a thousand times better. 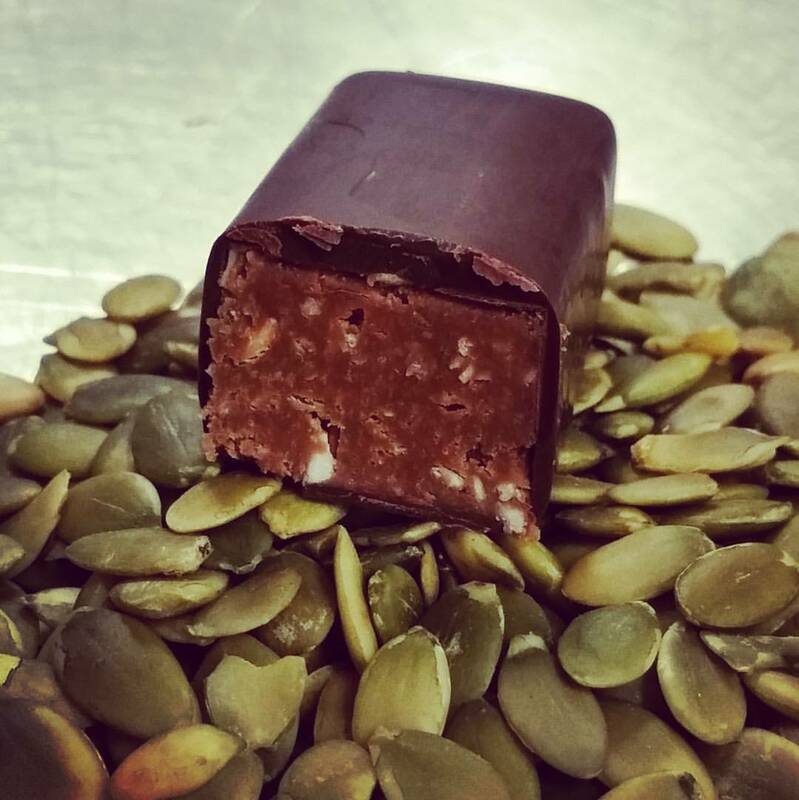 Nutty Nougat Bar: The healthier alternative to a Snickers with a dash of coconut: chewy, gooey, and delicious! 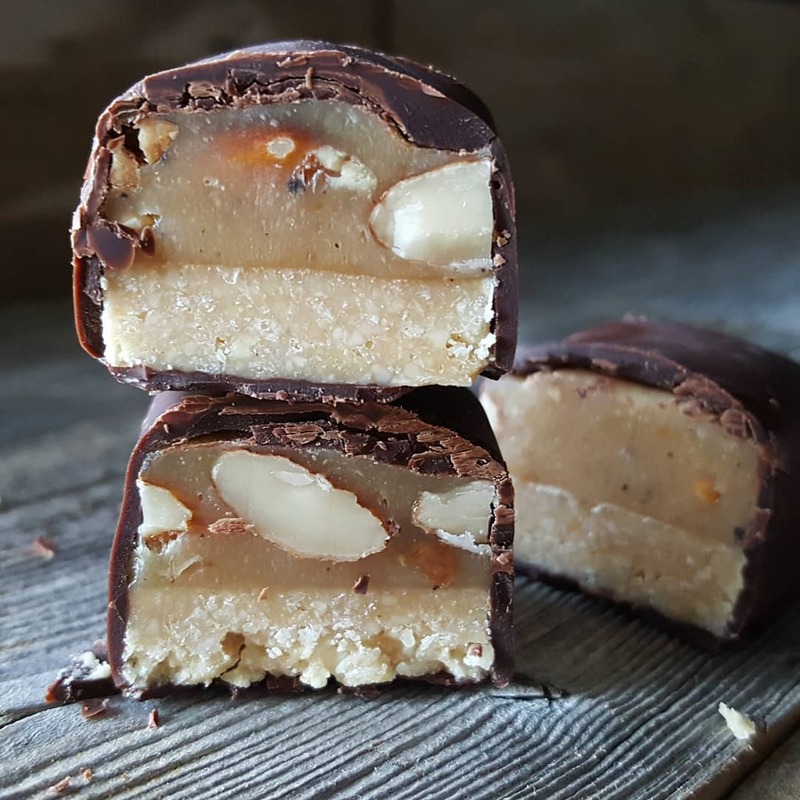 Peanut Butter and Coconut Bar: Although this bar is primarily made with organic peanut butter, pumpkin seeds are the secret ingredient that add a nutritional boost and even more flavor. 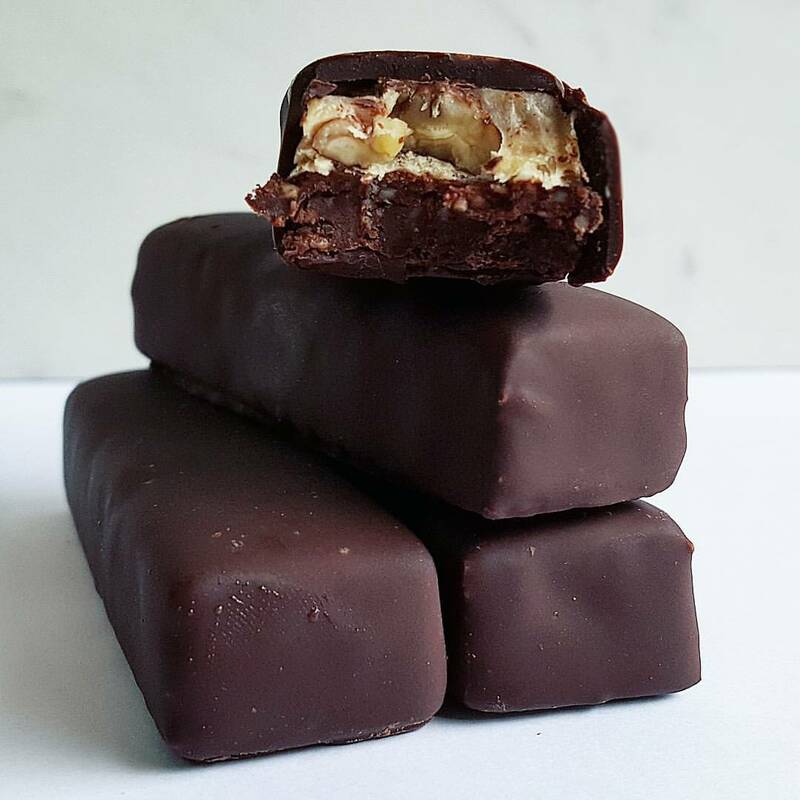 The chocolate used in all the bars is Agostoni’s 71% Dark Chocolate Couverture made with organic chocolate liquor, organic cocoa butter, organic cane sugar, and organic vanilla. 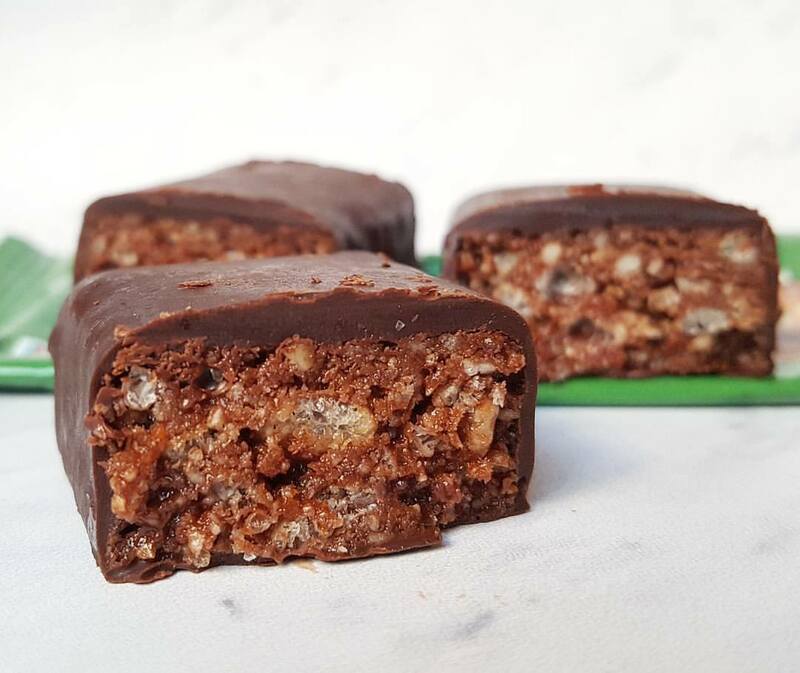 The candy bars contain only raw organic nuts (except for the roasted peanuts) and are gluten and wheat-free (although the bars have not been certified gluten-free). When sweeteners are used, small amounts of brown rice syrup and agave are used (each 1.6 ounce bar has between 9-14 grams of sugar which is remarkable for a candy bar). The bars can be kept at room temperature for a week or up to 6 months in the refrigerator (but allow the bar to come to room temperature first because the flavor is more complex at room temperature although the bars are also delicious right out of the refrigerator, too). Available at Whole Foods Market, Shop Rite, Sprouts, Fresh Market, Tops, Gelson’s, Bristol Farms, Seasons and more in the refrigerated section. 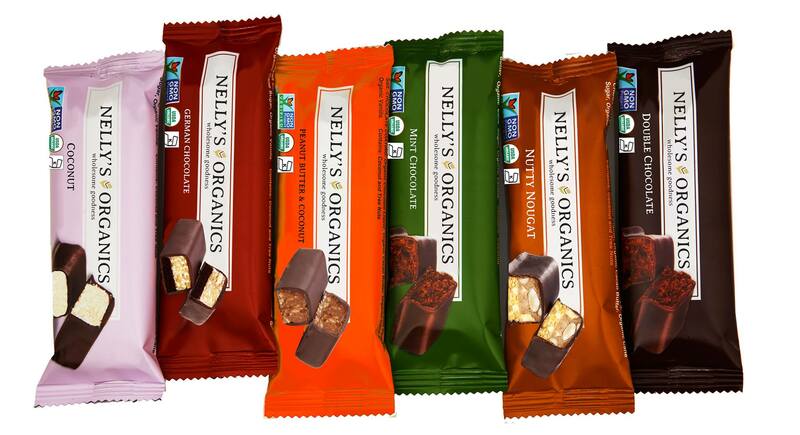 Or, order on-line directly from Nelly’s Organics (www.nellysorganics.com) where a mixed box of bars sells for $25.99. 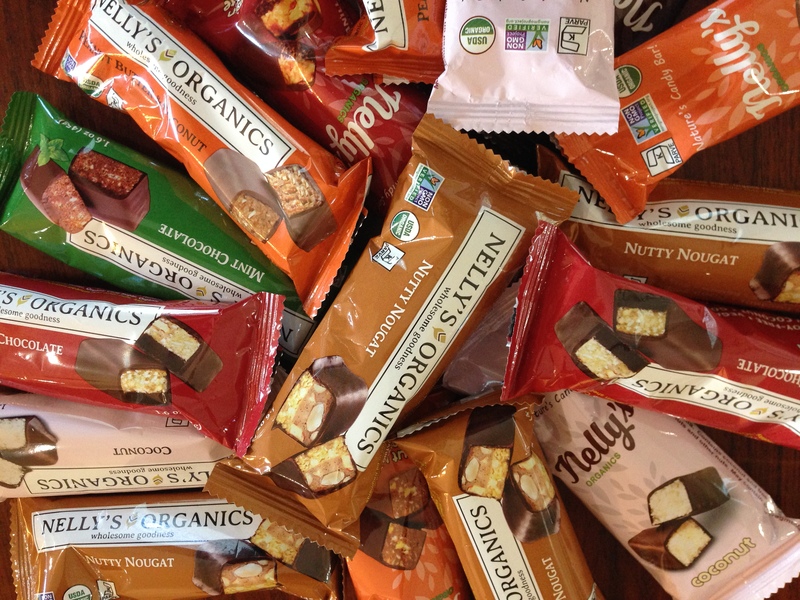 Find your favorite and then order a box (of 9 bars) of your favorite for $25.99. Shipping is free for all orders of $50 or more. Wow these sound so good. I think my first two choices would be Nutty Nougat and Coconut. Mmmm I guess I need to make a trip to Whole Foods.